Rage of Bahamut reminds me very much of another digital card game called Lord of Vermilion. I guess the common point is the slightly more Asian style art. Those who have not played the game before can probably treat this as a fantasy character artbook. 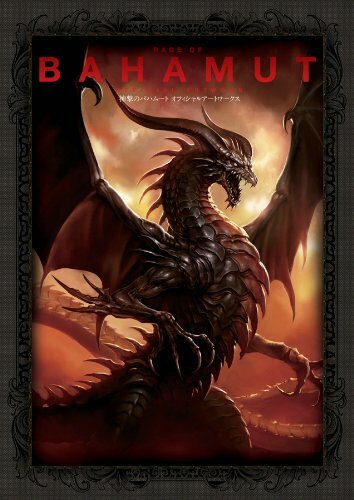 Rage of Bahamut is the popular card battle game on Android and iOS devices released in 2012. There was also a Japanese artbook released later that year called 神撃のバハムート オフィシャルアートワークス. And this is the English edition of that book as translated by Udon. It's a 144 page large format paperback. The artworks are fantastic, detailed and beautifully coloured. They are split into three groups, women, men and creatures. Two-thirds of the book are human characters. I prefer the creature artworks though as I've always enjoyed looking at creature designs. Maybe because the artists are Japanese, or the game was released for Japanese, the character designs have the familiar manga and anime style. Overall, it's a delight looking at the heavily decorated illustrations. At the back of the book are some process shots of the creation progress, basically from the sketches, to basic colour filling, and the finish coloured version. There's also a brief section that shows how two similar cards are redesigned into two different cards, e.g. with the same character but in different setting. There are more than 120 cards featured. Each card only has the title and the artist, but there's nothing about the card itself such as the profile or its rarity. That's the downside because I certainly wanted to read the story behind each character and creature. The only text in the book are the two pages of interviews, one with the junior artists Ponzu, Soji Hisakata, Mushimaro, and the other page with the senior artists Ryosuke Aiba and Tricky Agura. Even if you have not played the game, you should still be able to enjoy the art.